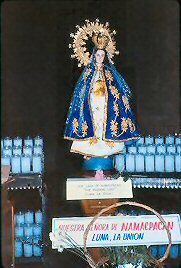 The statue of Mary arrived by ship in the Philippines in 1871. It was destined for a seminary in Ilocos Sur, but a storm forced the ship to seek temporary safety in port at the town of Namacpacan near the China Sea. The town itself had received this name because of the charity and hospitality of its people to their neighbors who had been persecuted by the Spanish. After the storm passed, the ship made several attempts to sail to its destination but each time was forced to return to port by high winds. Finally, the captain decided to transport the statue overland by hand. But despite repeated attempts by strong natives, the box containing the statue could not be even moved. Finally, it was concluded that it was Mary's intention to remain in the town. All agreed to honor the Virgin's wishes and her image was given a place of honor in the Church of Namacpacan. Numerous miracles have been associated with Mary. In one case, a young lame girl who was often left alone at home by her parents who were farmers, received an old woman at her door one day who asked for a drink of water and some food. As the woman drank the water, some spilled on the girl's feet. When the lady was leaving, she told the girl to meet her at the church. The girl was immediately cured, and when she arrived at the church, she recognized its statue of Our Lady as her visitor. In another miracle, tribal families from the mountains came to the town asking for baptism. They said they were invited to receive the sacrament by a tall beautiful lady who spoke with them and gave them food and blankets. When they entered the church, they immediately recognized that statue of Mary as the lady and discovered the blankets she had given them lying on the floor at the foot of the altar. 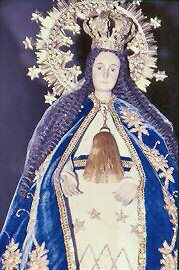 Mary, under the title of Our Lady of Namacpacan, is the particular patroness of farmers, fishermen, and planters threatened by calamities, pests, and drought.